I have had the wonderful opportunity to meet Carlos twice in the last 25 years. I met the whole Santana Band in 1990. 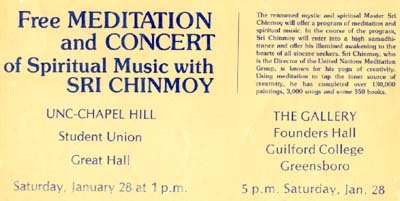 The first experience was at Guilford College, a small Quaker college in Greensboro, NC in 1978. The second experience was at The Mosque, in Richmond, VA in 1990. 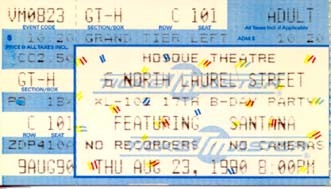 I took my brother and a couple of buddies to the Santana concert in my 1984 BMW 325e. We left Greensboro, NC early that afternoon and arrived in Richmond about an hour before the show. We parked by the backstage entrance and as I got out of the car I noticed that several buses were arriving. I wanted to wait and see who got off the bus. Some of my buddies decided to go down the street to get a beer and a slice of pizza. My brother, a buddy and I decided to stay. To my joy, we realized that the Santana bus had just arrived. We waited patiently and finally the band got off the bus and we all met them one by one. I was able to introduce my brother to Carlos ( one of the greatest heart-felt joys of my life ). Carlos was very gracious and present. 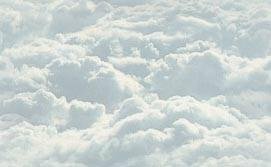 It was a moment that I hope I never forget. The funny thing is that I was holding a camera in my other hand while I was shaking Carlos' hand. I so wanted to have a photograph of me standing with Carlos. The third experience was meeting Raul and Chester at The Palace in Myrtle Beach, SC on October 14, 1999. You can see a picture of us on the Santana Art Gallery page. Raul, Hester and I talked about the world series baseball game and Chester and I talked about old days with The Tower Of Power band. I'm also very honored to have received such wonderful art work from Michael Rios. He and I have been talking on the phone for about 2 years now. We've just completed a transaction for some of his most recent art work. He also signed the T-Shirt that he and I designed over the phone. He is truly a ray of joy and inspiration for my life. Be sure and drop by his web site.